John Deere’s new 6R and 7R Series tractors and 8000 Series self-propelled forage harvester, all featuring the company’s latest fuel-efficient, Stage IV compliant engines, will be making their Irish debut on the John Deere stand at the 2015 FTMTA Farm Machinery Show next February. Spearheading the 6R Series mid-size tractors from Mannheim, the six-cylinder 6215R features enhanced manoeuvrability, improved operator comfort and an industry leading extended service interval of 750 hours. The tractor is powered by a new 6.8-litre engine rated at 215hp (97/68 EC), with an extra 40hp boost available for transport and pto work from the intelligent power management (IPM) system. Fuel efficiency of this new model can be enhanced by choosing either the established AutoPowr continuously variable transmission or the new, advanced double-clutch DirectDrive transmission. The new CommandARM – as featured on John Deere’s latest 7R and 8R Series tractors – features an electronic joystick and a Generation 4 CommandCenter display. In addition, this FarmSight-ready 6R Series tractor can be fitted with JDLink telematics as an option, to include remote display access (RDA) and wireless data transfer (WDT). John Deere’s 7310R was the company’s first European tractor to feature a Stage IV compliant engine. This top of the range 7R Series model produces 310hp at rated engine speed, with an extra 30hp for transport and pto applications, and heads a range of five other tractors from 210 to 290hp. 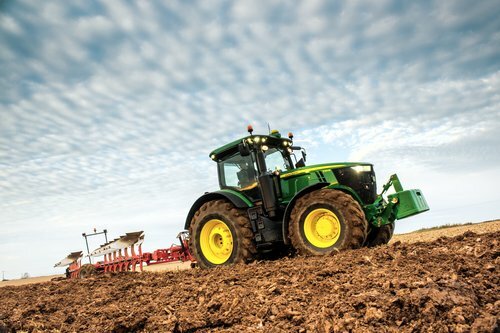 Even with the addition of selective catalytic reduction (SCR) to the engine, John Deere can claim to reduce total fluid consumption to even lower levels than before – the 7310R recently set a new fluid efficiency record for high horsepower Stage IIIB and Stage IV tractors in the DLG’s demanding Powermix test in Germany. The new 7310R tractor offers a choice of AutoPowr or the newly designed, fully automatic e23 transmission with Efficiency Manager, which has 23 equally spaced power shiftable forward gears and 11 reverse. This allows the operator to preset the working speed, and helps to save fuel by keeping the engine rpm at an optimum speed by automatically shifting up and throttling back. Other new features on this tractor include the CommandView III cab with CommandArm console and Generation 4 CommandCentre display. Integrated systems also enable the use of John Deere’s FarmSight precision farming technology. The top of the range 8600i wide body self-propelled forage harvester on show features a 625hp 13.5-litre John Deere engine, the unique, award-winning HarvestLab constituent sensing system and new KernelStar2 multi-crop processor. The forager’s AutoLOC (automatic length of cut) feature allows the operator to pre-select the precise cutting length based on actual forage conditions. John Deere is currently the only forager manufacturer with a proven, accurate, commercially available system for measuring both grass and maize constituents in real time. Mounted on the forager spout, the versatile HarvestLab system can be removed easily for stationary feed analysis of different forage ingredients and for clamp silage analysis in the winter. Additional new features on the 8000 Series foragers include the ADS Twin Line fully integrated advanced dosing system for silage additive application, and a wide range of headers. These include grass pick-ups from 3 to 4.5m and Kemper rotary headers from 6 to 9m wide. Kemper maize headers are optionally available with automatic steering and/or automatic header control. For wholecrop harvesting, John Deere also offers the Zürn ProfiCut 620, a highly efficient silage header that leaves clean, low-cut stubble. Other new John Deere machines making their FTMTA Farm Machinery Show debut include the 5M, 6MC and 8RT Series tractors, mid-specification M700 trailed sprayer, F440R fixed chamber round baler and the latest model T560 combine harvester and XUV 855D Gator 4x4 utility vehicle.